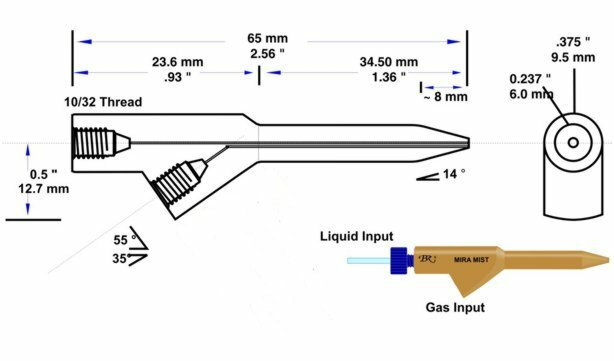 All Burgener Nebulizers use Teflon for the sample passage and for the gas orifice, except for the Mira Mist CE,Enya Mist and X-175 which have Teflon bodies and PEEK sample passage and gas orifice. Most Burgener Nebulizers are 100% Teflon except for the removable gas fittings, but the PEEK Mira Mist and the Ari Mist use PEEK for the outside body, and Teflon for the inner capillaries. All Burgener Nebulizers use the patented Enhanced Parallel Path Method of creating a mist. None of our nebulizers have suction, so liquids must be pumped to the nebulizers. not likely All High Salts, Medium Particles, excellent %RSD (< .7%), very good sensitivities and excellent long term stability. Not appropriate for concentrated acids, some organics. not likely All High Salts, Medium Particles, excellent %RSD (< .7%), very good sensitivities and excellent stability. Excellent for all acids, all organics. T 2100 PTFE 30-40 500 - 2500 750 34 mm 6 mm 65 mm 2 mm Nearly Impossible All High Salts, Particles, excellent %RSD (< 1%), very good sensitivities and excellent stability. not likely All Medium Salts, NO Particles, good %RSD (< 1%), Excellent sensitivities. available. No All High Salts, Particles, good %RSD (< 1%), good sensitivities. Can not plug nebulizer - inner sample passage larger than capillary used to carry sample from pump to nebulizer. chamber Designed for CE / ICP / MS. Allows CE capillary to extend to tip. Also runs as excellent nebulizer without CE capillary. not likely All Medium Salts, small Particles, good %RSD (< 2%), Excellent sensitivities and low flow capable. Ultra Clean PFA construction. All wetted parts are PFA. X - 175 Teflon & PEEK 40 50 - 1000 175 34 mm 6 mm 65 mm 2 mm easy All standard Medium Salts, NO Particles, good %RSD (< 1%), Excellent sensitivities. NX - 175 Teflon & PEEK 30 50 - 1000 175 34 mm 6 mm 65 mm 2 mm easy All standard Medium Salts, NO Particles, good %RSD (< 1%), Excellent sensitivities. chamber Medium Salts, NO Particles, good %RSD (< 1%), Excellent sensitivities. Works with Burgener Mini Chamber - simpler than direct injection with same advantages. chamber Medium Salts, NO Particles, good %RSD (< 2%), Excellent sensitivities but low flow lowers intensities. Tiny sample passage allows for split flow - pump 30 - 50X what actually arrives in the nebulizer. The rest goes to the drain. Minimizes oxides in ICP/MS. at 50 psi 10 - 5,000 1800 2" - 18" 0.125" Varies 1/8" No Special High Temperature, low to high flow. Commonly used for material coatings and nano particle production. at 40-50 psi 2,000 - 30,000 1000 12 mm 1/4" pipe thread Varies 1/8" No Industrial High Sample Flow, excellent mist. Runs 2 to 50 ml/min, with optimum from 5 to 35 ml/min. Designed for industrial applications, not for ICP analysis. 0.5" Varies 3 mm No Industrial High Sample Flow, excellent mist. Runs .5 to 80 ml/min, with optimum from 5 to 70 ml/min. Runs 1 to 100 ml/min, with optimum from 5 to 80 ml/min.